Quinnipiac is officially in a slump. For the third time in the last four weeks they finished a weekend getting swept. They have lost 6 of 8 games in November to fall to 5-7-1 on the season. The Bobcats have a short turnaround with an early week game against a talented Princeton team on Tuesday night at Hobey Baker Rink in Princeton, New Jersey. A year ago it was the Tigers who dominated in Quinnipiac in a sweep that essentially helped keep the Bobcats out of the NCAA tournament. Right now Quinnipiac is just fighting to possibly save its season from taking a down turn. Princeton has one of the better offense's that Quinnipiac will see this year in the ECAC. They are averaging 3.22 goals per game and have some impressive forwards that can consistently find the back of the net. Quinnipiac will need to be able to contain the top line of Ryan Kuffner (10 points), Alex Riche (6 points) and Max Veronneau (11 points) in order to slow down the Tigers strength on offense. They also get strong production from Jackson Cressey (8 points) and Eric Robinson (8 points) along with senior David Hallisey (7 points). 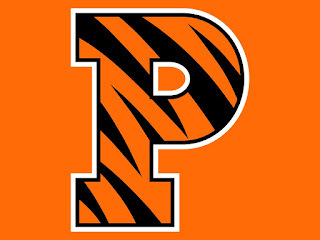 Special teams for Princeton are a strength with their power play second strongest among ECAC teams at 21.88% (7-of-32). 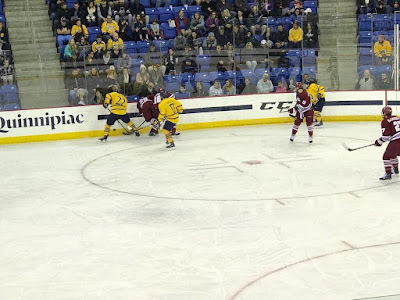 Quinnipiac has had some defensive lapses recently that it must get cleaned up or Princeton is the type of team that will make them pay with the talent they have up front. Defensively Princeton is ranked tied for 31st at 2.89 goals per game but that number is high due to a couple of bad games against good ECAC teams (Cornell and Union). 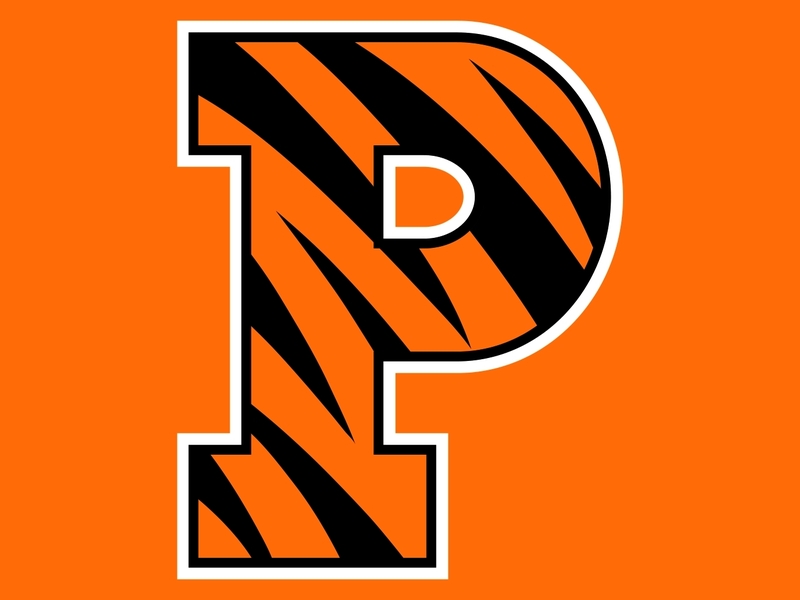 Princeton's senior defensive pair of Matt Nelson and Joe Grabowski are the most experienced defenseman for the Tigers but so far a combined minus six. Josh Teves (8 points) and Matthew Thom form the second pair and combined they are a plus five on the season so far. Reid Yochim and Derek Topatigh make up the third pair and they have provided some offense to the Tigers from the blue line with 9 points combined. As I said earlier, Princeton has good special teams and that includes their penalty kill which is 8th best in the country at 87.5% (28-of-32). Quinnipiac has been struggling on offense only mustering 4 goals this past weekend against a young but talented UMass squad. After seeing Colton Phinney man the pipes for the past four seasons, the Bobcats will see a new face in goal with freshman Ryan Ferland expected to get the nod for the Tigers. The 6'0 175 pound Franklin, Massachusetts native is off to a solid start with a 2.84 goals against average and a .918 save percentage along with a 4-3-1 record. He struggled a bit against two of the better teams in the ECAC (Cornell and Union) but has given the Tigers some stability back there in goal. 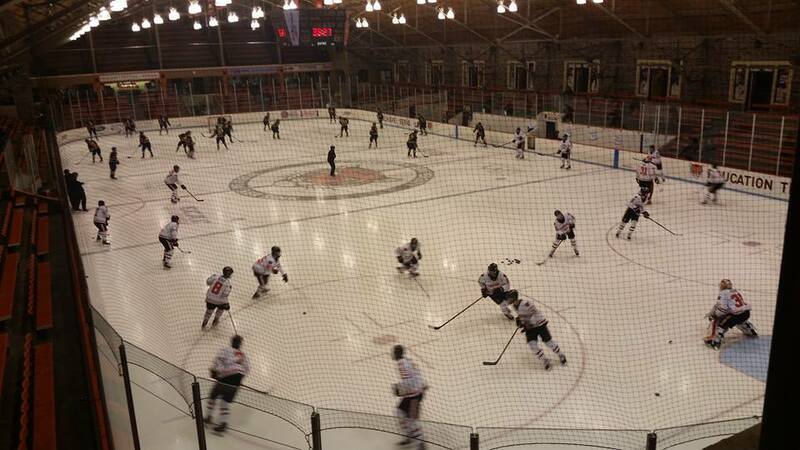 I think Princeton is going to give Quinnipiac everything they can handle tomorrow night. 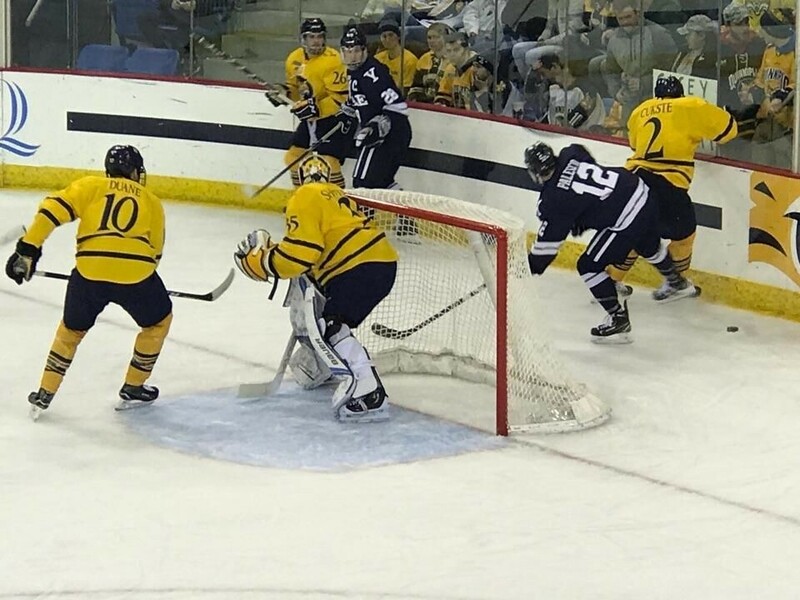 With the season sputtering on the verge of getting out of control, Quinnipiac needs a character win to build something off of because if the losses continue to mount up, the frustration possibly could start to set in up on York Hill in the second half of the season. Just a week ago the Quinnipiac Bobcats men's ice hockey team scored 8 goals and won two games. It looked as if they might have turned a corner. Fast forward one week and the inconsistencies on offense have returned as Quinnipiac fell 2-1 to UMass Amherst in the first leg of a home and home series at Frank Perrotti Jr. Arena on Friday night. This is the 5th time this season that Quinnipiac has failed to score more than one goal in a game. Four of those games were losses with the other being a tie against Boston College. One thing is certain is that the offensive issues of this team are very real. The visitors from Amherst brought a slew of talented freshman into Hamden and they did not disappoint accounting for both goals and the lone assists on each goal. Mitchell Chaffee scored his 4th goal of the season 11:46 into the opening frame on a feed from leading point scorer Oliver Chau. Quinnipiac had its opportunities with 16 shots on goal in the opening frame. 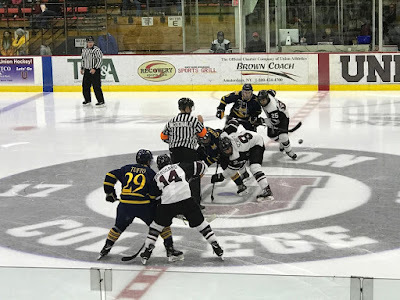 The Bobcats got its lone goal 1:51 into the second period when some slick passing by Tanner MacMaster and Odeen Tufto set up John Furgele for his first goal as a Bobcat since transferring from the University of New Hampshire. However that lead was short lived when just over two minutes later San Jose second round draft pick Mario Ferraro sniped a tough angled shot that got by Quinnipiac goaltender Andrew Shortridge for the goal. Quinnipiac had some opportunities in the third period but could not capitalize. Kevin Duane was given 5 minute major for a contact to the head and a game misconduct on a hit that looked like a good hockey hit. The lone bright spots were Andrew Shortridge who made 23 saves and the Quinnipiac penalty kill which was a perfect 5 for 5 on the night. The home and home series wraps up tomorrow night in Amherst where Quinnipiac needs to avoid being swept for the third time in the past four weeks. With the losses piling up the Bobcats chances of getting an at-large bid down the road are starting to dwindle as the pairwise rankings are starting to matter along with the fact they are losing to teams below them in the rankings. Coming off their first two conference wins, Quinnipiac now heads back into out of conference play with a home and home series with UMass Amherst that begins Friday night in Hamden and wraps up the next night up in Amherst at the Mullins Center. Quinnipiac is going to see a UMass team that turned over half the roster from a year ago. The Minutemen have 13 freshman with many of them seeing serious playing time for Greg Carvel's team as he looks to make them much more competitive than they have been in the past. They are off to a decent start this season at 5-6 with wins over Union on the road and Providence at home. With so much youth on the UMass roster, there have been good nights and some bad nights but the pieces are in place to be a very respectable team this year and pretty good in the years to come. All time Quinnipiac is 7-2-2 against the Minutemen. The UMass offense is very young but has some intriguing talent. They only average 2.78 goals per game but 10 of the forwards who have seen a bunch of game action are either freshman or sophomores so you can expect growing pains. Four of their top five scorers are freshman with the lone senior forward being Niko Rufo (8 points). Two freshman in Oliver Chau (10 points) and Amherst native John Leonard (9 points) are the two top scorers for the Minutemen followed by Rufo. Freshman forward Mitchell Chaffee has 6 points while they are getting some contribution from two of the freshman defenseman in Cale Makar (6 points) who was the 4th overall pick by Colorado in the 2017 draft along with Mario Ferraro (5 points) who was drafted in the second round by San Jose in the same draft. UMass has a power play that has struggled to a clip of 14.29% (7-of-49) while the Quinnipiac penalty kill has improved to 80.4% (37-of-46). 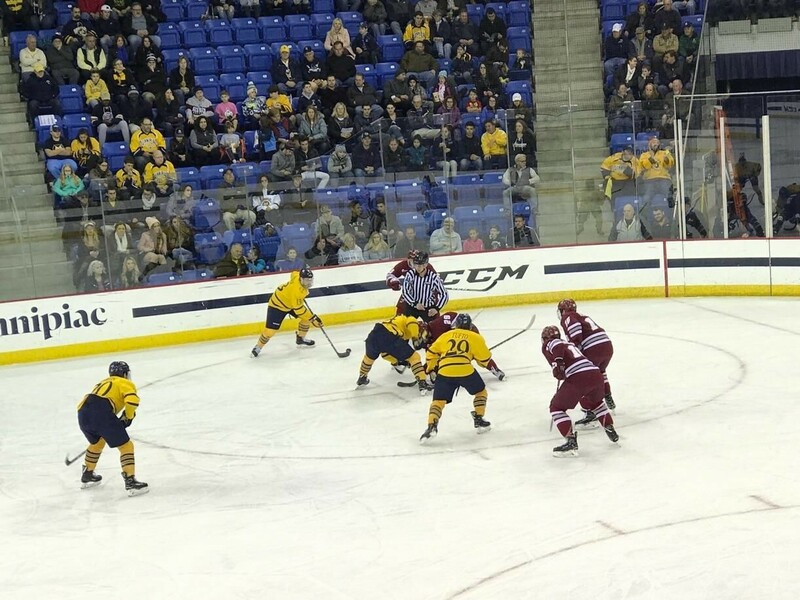 The Bobcats need to use their experience on defense to force the young Minutemen forwards into mistakes in order to generate turnovers which can lead to quality opportunities for Quinnipiac. UMass has struggled on defense this season giving up 3.18 goals per game. They have some high end talent with Makar and Ferraro that can provide offense as well as be consistent on the blue line. However this defense is just so young with freshman and sophomores manning the blue line that their lack of experience is hurting them. The lone senior back there is Jake Horton while sophomores Jake McLaughlin and Josh Couturier see a lot of minutes on the blue line. 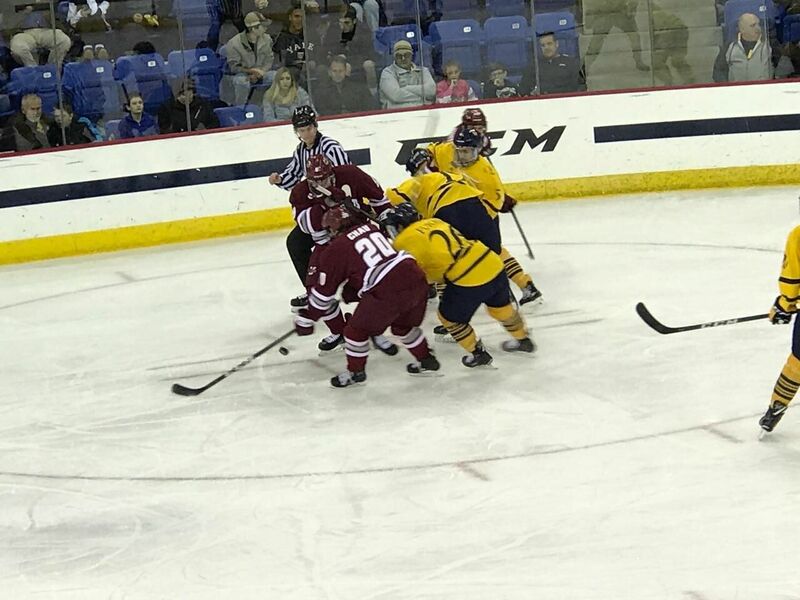 While Quinnipiac hasn't been lighting up the scoreboard offensively like they have in the past they have some experience up front along with some talent to make UMass pay if it struggles on defense. The Minutemen have been average on the penalty kill at 79% (49-of-62) while Quinnipiac has seen some improvement on the power play recently outside of the Yale game at 17.50% (7-of-40). 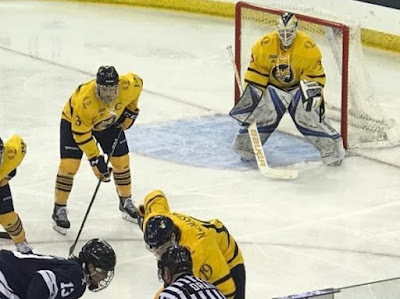 Quinnipiac needs to build off last weekend's sweep and has to come away with two victories over this holiday weekend because at this point they can not afford many more pairwise slip ups especially with a loss to RPI on the season. 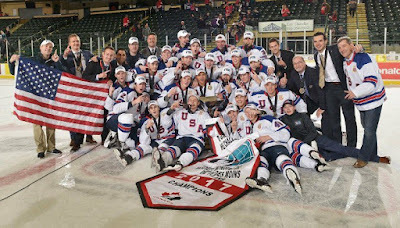 They need to get strong goal-tending, the defense to play well, have a strong fore-check, hunt the puck and get some timely goal scoring in order for the results to go in their direction. ECAC Hockey in a press release has named Andrew Shortridge as its goaltender of the week after posting back to back shutouts this past weekend against Brown and Yale. The sophomore from Anchorage, Alaska made 52 saves over two games as Quinnipiac picked up its first two conference wins of the season. This was the third shutout of Shortridge's career as he posted a 1-0 shutout back on February 3, 2017 on the road against Brown. In 9 games played this season, Shortridge is 4-4-1 with a 1.85 goals against average and a .925 save percentage. This is the first career ECAC goaltender of the week award for Shortridge who last season won back to back ECAC rookie of the week awards for the weeks of February 28th and March 8th. Quinnipiac got back into the win column with their first conference win of the season in a 5-0 win Friday night against the Brown Bears. 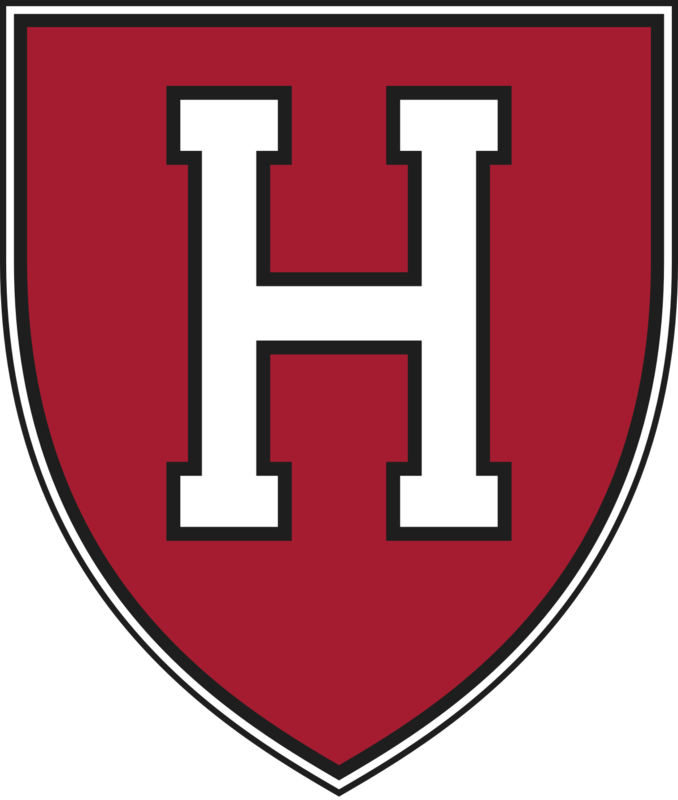 Now comes the Heroes Hat game against their Whitney Avenue rival, the Yale Bulldogs who are 3-4 on the season. Quinnipiac moved up to 11th place in the ECAC with its win Friday night. The hope is that the Bobcats can build off of what they accomplished against Brown and use to going into the Yale game and beyond. With students on Thanksgiving break it might not have the buzz of previous past Yale games due to the holiday break and for the fact that both teams are having poor starts the season. It is still an important game and one that Quinnipiac always circles on its calendar. The Yale offense has been Jekyll and Hyde so far this season looking great in three wins but non existent in three losses this season until Friday's night 5-4 loss to Princeton. Averaging 3.29 goals per game they are led by junior Joe Snively who is off to a hot start with 5 goals in seven games and senior Ryan Hitchcock who has 7 points (2 goals, 5 assists). Freshman Dante Palecco has begun his collegiate career strong with 6 points (4 goals, 2 assists) in 7 games while the Smith twins of Evan and Mitchell have 5 points apiece. Junior Ted Hart and Yale's lone forward draft pick Luke Stevens are both off to slow starts with 3 points apiece. The Yale power play has been by far the worst in the country this season at 5.88% (2-of-34) while the Quinnipiac penalty kill is starting to show improvement at 78% (32-of-41) along with going 4 for 4 against Brown on Friday night. The key for Quinnipiac is shutting down the Snively-Hitchcock-Palecco line as they have been Yale's three best players this season. Having the last change against those three will give the Quinnipiac coaching staff the ability to match up defensively against that line in critical situations and defensive zone draws. Yale's defense also has been a bit Jekyll and Hyde this season as it has struggled in its losses giving up 16 goals. For the season they are giving up 3 goals per game. The Bulldogs have some really solid players on the blue line in freshman Phil Kemp (3 points, plus 5) and sophomore Billy Sweezey (5 assists, plus 1). Anthony Walsh (plus 4) and Adam Larkin (plus 3) have also looked solid at times on the blue line. They have definitely improved from where they were a season ago when they vastly struggled on the blue line. How far they will go will rest on if the defense can play a lot better than it has so far this season but the talent is there for improvement. Yale's penalty kill is a shade better than Quinnipiac's at 78.8% (26-of-33) while Quinnipiac power play has seen much improvement up to 21.21% (7-of-33). Junior goaltender Sam Tucker has a sub .900 save percentage at .896 in 7 games played with a 2.74 goals against average. His best game was a 5-2 win over Harvard and he also beat both Brown and St. Lawrence. He has struggled in back to back games giving up 9 goals in total to Clarkson and Princeton though both of those teams have some of the best offensive talent in the ECAC this season. We will see if Quinnipiac can translate last's nights offensive success into a big night against Tucker. A win over Yale will give the Quinnipiac some solid confidence as they head into Thanksgiving along with heading back into non conference play with a home and home series with UMass Amherst next weekend. Five games into their ECAC slate, the Quinnipiac Bobcats have recorded their first conference win with a resounding 5-0 win over the Brown Bears. Coming off back to back weekends of being swept in conference play, Quinnipiac was in desperate need of a victory. It was a good night for Quinnipiac to bring out the UPS slogan "What can Brown do for you" because that is exactly what happened tonight as the Bobcats got in the win column and looked strong in doing so. They moved the puck well with crisp passes, good forecheck and and all around solid game from their defense and goaltending. It was the Landon Smith show tonight for Quinnipiac as he scored a natural hat trick scoring the teams first three goals of the game. His first came just over 12 minutes into the first period on the power play when he scored off a rebound from John Furgele's initial shot. Less than two minutes later Smith again found the back of the net when he redirected Brogan Rafferty's shot past Luke Kania. Landon Smith found the back of the net for a third time just 2:27 into the second period when Smith cleaned up yet another rebound this time off the stick of Tanner MacMaster whose initial shot was saved by Kania. Quinnipiac scored a second power play goal when Bo Pieper fed Chase Priskie in the slot where he ripped a wrist shot home past Kania. Quinnipiac capped the scoring on the night when Landon Smith skated the puck freely into the zone before finding Tanner MacMaster on the doorstep where he put it home for the goal. Quinnipiac out shot Brown 36-22 for the game. Four players has multi point games led by Smith (3 goals, 1 assist), Chase Priskie (1 goal, 1 assist), Tanner MacMaster (1 goal, 1 assist) and Odeen Tufto (2 assists). Quinnipiac finished a strong night on special teams going 50% (2-of-4) on the power play and finishing 100% on the penalty kill (4 for 4). Andrew Shortridge made 22 saves for his second career shutout. This is a step in the right direction for the Bobcats as they now turn there attend to the Yale Bulldogs tomorrow night for the annual Heroes Hat game. 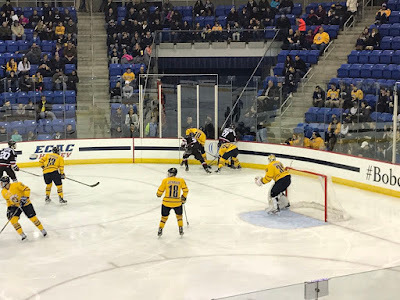 With the 4th consecutive conference loss to open a season for the first time in the Rand Pecknold era, Quinnipiac finds itself in unfamiliar territory being at the bottom of the ECAC standings. With a team that was picked second in the league by many this start by the Bobcats is unexpected to say the least. They return back to Hamden looking for their first conference win when they take on the Brown Bears Friday night at Frank Perrotti Arena. Brown is 2-4 on the season having a nice win over Yale to start the year and playing well against Clarkson last weekend in a loss before winning against St. Lawrence on Saturday. The Bears have the ability to give Quinnipiac all they can handle Friday night especially with the way the Bobcats have been playing as of late and it will take a total team effort for Quinnipiac to start the turnaround of their season. 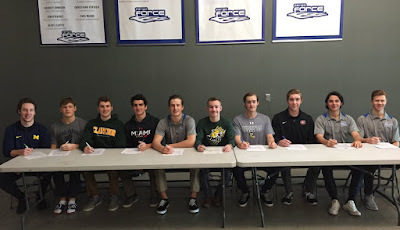 Bruno is only averaging 2.50 goals per game but they have players that can hurt you in a handful of seniors including Sam Lafferty, Max Willman, Charlie Corcoran and Tyler Bird. Sophomore Brent Beaudoin (5 points) is leading the team in scoring and they are getting early contribution from freshman Alec Mehr (4 points). Brown is only converting on 16.13% (5-of-31) of their power plays while the Quinnipiac penalty kill is 50th in the country at 75.7% (28-of-27). Quinnipiac has really struggled recently on defense giving up three goals per game which is very unlike a Quinnipiac team in that regard. I think some of Quinnipiac's struggles on the defensive end are due in part by their scoring woes. The defense is trying to make up for some of the lack of scoring up front and it is effecting them defensively which in turn has hurt the goal-tending as well. 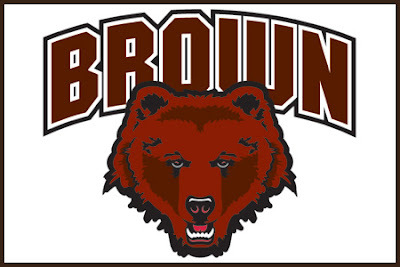 Brown's defense is giving up 3.17 goals per game but have played much better this season that they did a year ago. Coupled with the fact that Quinnipiac's offense is struggling mightily to a tune of 2.33 goals per game that has to make Brown feel a bit better about themselves on the defensive end. Some of Brown's younger defenseman have played well in Tony Stillwell, Joe Maguire and Zach Giuttari which have made things much easier than they did a season ago. The penalty kill for Brown has been solid as well at 83.3% (30-of-36). With the Bobcats power play struggling at only 17.24% (5-of-29) this should favor Brown in that category. Sophomore Gavin Nieto has gotten the majority of the starts in goal with 4 but freshman Luke Kania started against St. Lawrence and only gave up one goal. His only other start was against Dartmouth when he gave up four goals in a loss to the Big Green. Nieto has the experience from playing the majority for Brown and has the better save percentage this season a .910%. It remains to be seen who will get the start in net as I could see Brown coach Brendan Whittet starting either of these goaltenders Friday night. Quinnipiac cannot afford to look past Brown to the Yale game for a second. Bruno has looked like a much improved team that has some talent and is playing hard. 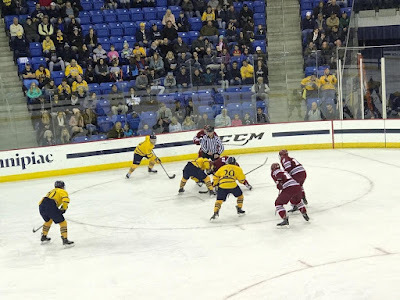 An early lead for Quinnipiac is a must in order to start to build confidence that they need to carry with them for the rest of the their schedule. It was another lost weekend for Quinnipiac as they were swept in the New York capital district region to lose their 4th consecutive ECAC game. At this point in the season I don't think anyone predicted or expected Quinnipiac to be sitting at 12th in the ECAC with no wins in the conference to boot especially for a team picked second in the league. There is still time for a turnaround but the team has to take it game by game at this point and focus on the task in hand in front of them. With that said lets take a look at what some of the future Bobcats did over the past week as many had some great accomplishments. Defenseman Domenick Fensore won a gold medal with the United States U-17 team at World Hockey Challenge in British Columbia, Canada. He finished the tournament with 4 assists in 6 games played as the United States did not drop a game in the tournament. 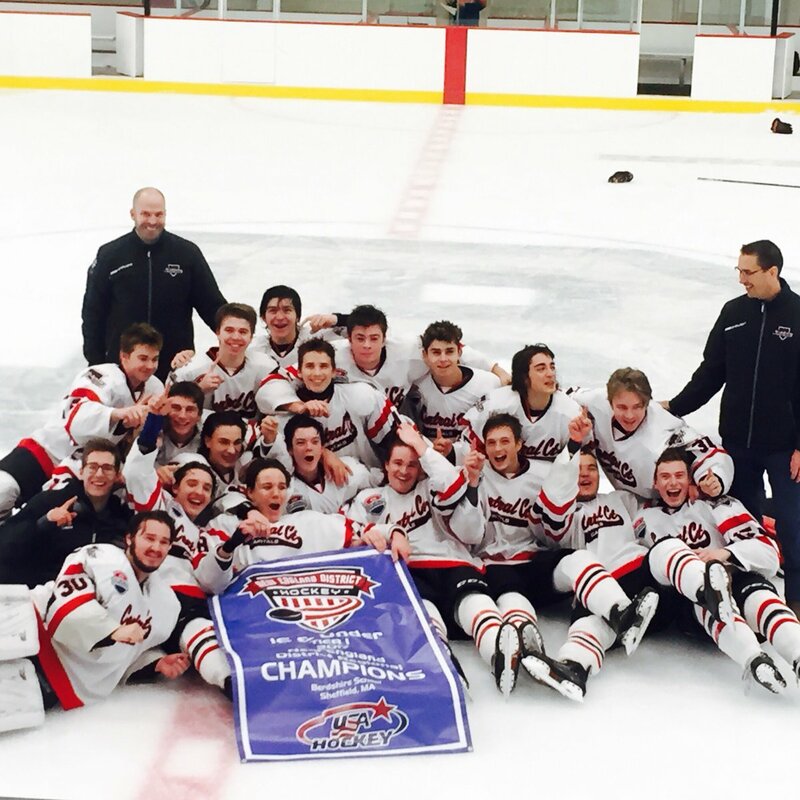 Four Quinnipiac commits won New England Regional Tier I championships this past weekend. Ethan Phillips and P.J. 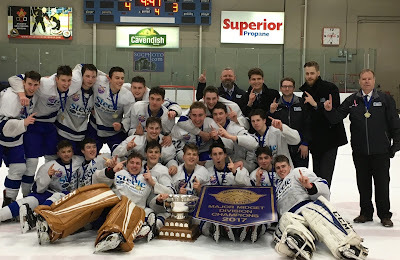 Fletcher were part of the South Kent U16 team that won the title over Yale Hockey Academy getting redemption from a season ago when they were knocked out by Yale at the U-15 level with many of these same players. Phillips had 3 goals and 6 assists while Fletcher had 4 goals and 3 assists. The two really put those numbers up in 3 games as they really only played 2-3 shifts in the third game as they were resting for the championship game. Victor Czerneckianair was part of the South Kent School U-15 team that also won the New England Tier I regional championship. 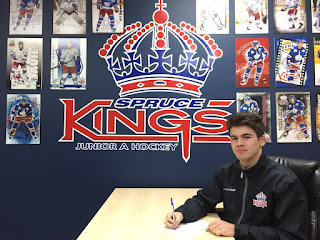 Both of these teams now will head later on this year to the USA Hockey National Championships in Philadelphia, PA.
Peter Diliberatore fresh off signing his national letter of intent was part of the Yale Midget program that won the U-18 New England Regional Tier I championship. 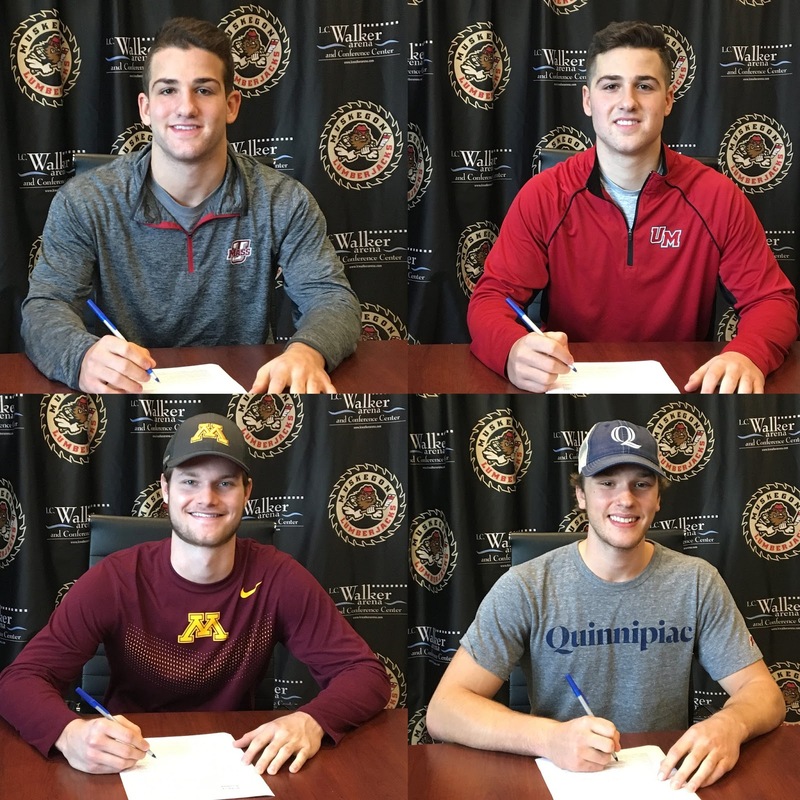 It was a strong week for some of Quinnipiac's incoming players for next season with two of them signing national letters of intent with the program. 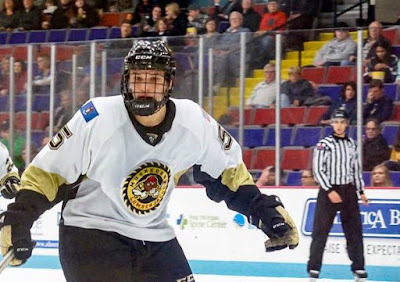 Wyatt Bongiovanni had a 5 point week (3 goals, 2 assists) for the Muskegon Lumberjacks headlined by a hat trick last Wednesday. He now has 7 points in 12 games after getting off to a slow start in October. One of the Bobcats newest commits, William Fällström committed last week to Quinnipiac had two goals in his past two game since making his college commit. In 14 games for the Fargo Force he has 9 points (3 goals, 6 assists). The native of Stockholm, Sweden was formally verbally committed to the University of Minnesota. 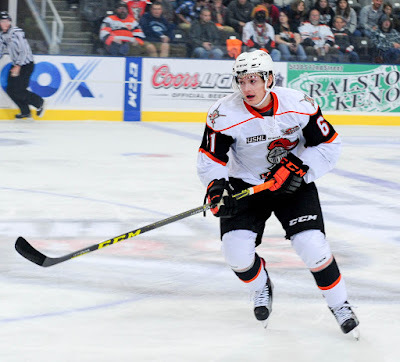 Zach Metsa had the overtime winning goal for the Youngstown Phantoms over the Muskegon Lumberjacks this past Saturday. In 12 games this season he has 4 points (1 goal, 3 assists) from the blue line. Matt Cassidy had a three point week for the Brooks Bandits (1 goal, 2 assists). 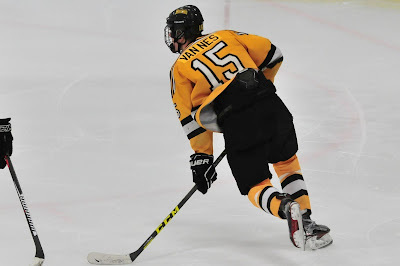 He has 11 points in 15 games played for Brooks playing on the Bandits top line. 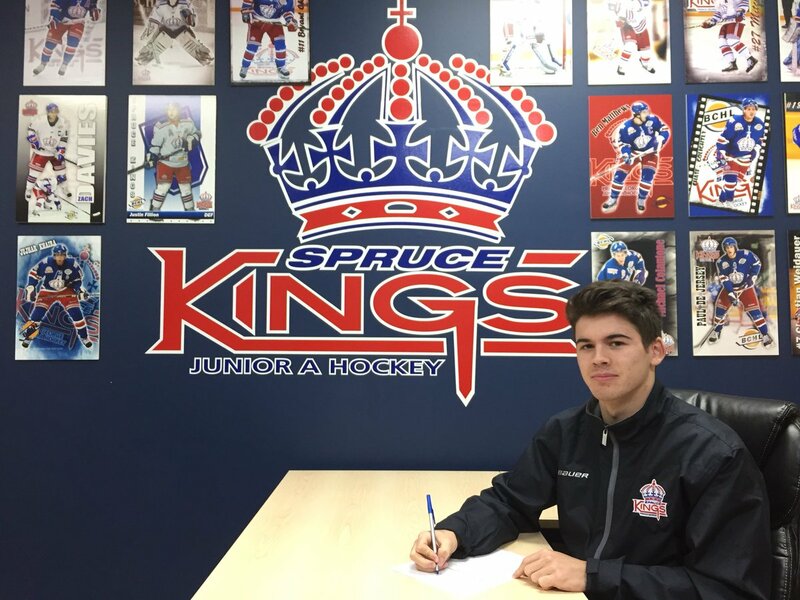 Ethan De Jong of the Prince George Spruce Kings had a strong week with a goal and five assists for the Prince George Spruce Kings. De Jong in 25 games this season, has 30 points (9 goals, 21 assists). This past Sunday he had 3 primary assists in his game against West Kelowna. Michael Lombardi had a 4 point week for the West Kelowna Warriors and has points in his last 5 games. 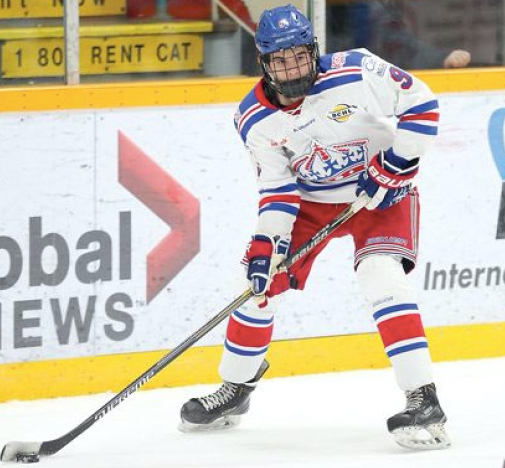 In 22 games played this season, Lombardi has 13 points (6 goals, 7 assists) but is starting to find his groove with his trade to West Kelowna. Jacob Quillan had a three point game (1 goal, 2 assists) on Sunday to take the team scoring lead. In 18 games played, Quillan has 21 points (8 goals, 13 assists). Austin Spiridakis picked a goal this past weekend for the St Albert Tire Warehouse Raiders (AMHL). On the season he has 5 points (3 goals, 2 assists) in 13 games played. Connor Tait had a three point weekend for the New Jersey Hitmen NCDC team. The Boyd, MD native is starting to settle in within the past few weeks. In 21 games played he has 8 points (4 goals, 4 assists). 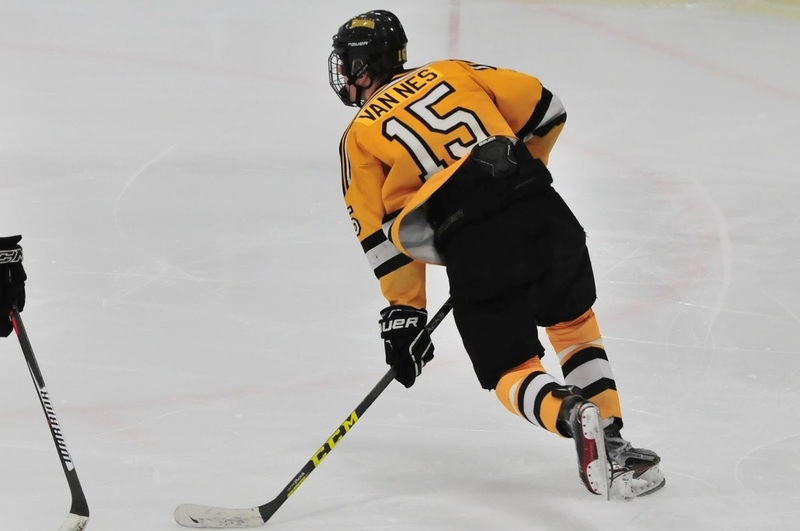 Quinnipiac's newest commit Gus van Nes who committed on Friday had a strong weekend with 5 points (3 goals, 2 assists) including a hat trick on Saturday. A native of the Netherlands, van Nes becomes the second Dutch born player to play for Quinnipiac following Mike Dalhuisen. In 21 games played this season, he has 23 points (8 goals, 15 assists). For the first time in the Rand Pecknold era, Quinnipiac has begun the season 0-4 in conference play. This includes ECAC play and their two former conferences, Atlantic Hockey and the MAAC. A night after coughing up a two goal lead at RPI, #16 Quinnipiac fell behind early and never recovered losing 4-1 to the Union Dutchmen. The lack of discipline by the Bobcats hurt once again with the team taking six penalties highlighted by the second period 10 minute misconduct penalty for unsportsmanlike conduct by Kevin McKernan. Union opened the scoring just over five minutes into the game on Ryan Scarfo's sixth goal of the season coming off a juicy rebound from Andrew Shortridge off Cole Maier's initial shot ripping home a wrist shot past a diving Quinnipiac goaltender. The Dutchmen made it 2-0 towards the end of the first period on Anthony Rinaldi's 8th goal of the season. Quinnipiac's frustrations continued in the second period taking a penalty less than four minutes in followed by the misconduct by McKernan which was then followed by a Union power play goal from Luc Brown. 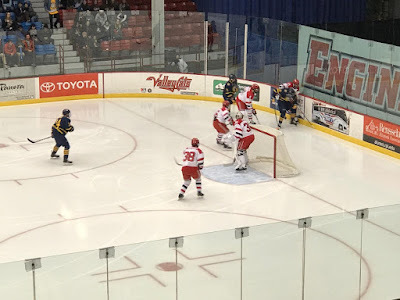 The Bobcats took two more penalties in the period and midway through the period, Quinnipiac made a goaltending change when Keith Petruzzelli relieved Shortridge. In the third Quinnipiac avoided being shutout when Chase Priskie scored on the power play for his 4th goal of the season. Karlis Cukste and Scott Davidson assisted on the goal. That was as close as Quinnipiac got for the rest of the game as Luc Brown scored a late power play goal for the Dutchmen to close the scoring. Quinnipiac will fall out of the USCHO.com top 20 poll come Monday after being swept yet again this weekend. Quinnipiac will be searching for answers this week as they welcome Brown next Friday to Perrotti Arena along with rival Yale on Saturday as Thanksgiving break commences on the Quinnipiac campus. The #16 Quinnipiac Bobcats coming off a 5-3 loss against RPI after having a two goal lead have lost their first three conference games of the season. 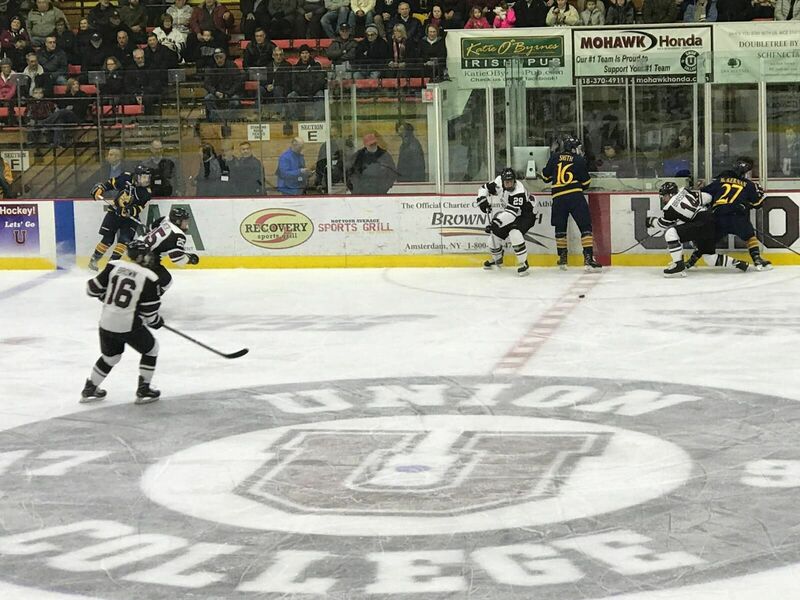 The Bobcats now head to Union as the Dutchmen are coming off six wins in their last seven games after starting the season with five straight losses. Rick Bennett's team has righted the ship with their play recently. Quinnipiac is looking to right the ship after a disastrous start to ECAC play and can ill afford to fall behind the eight ball anymore in conference play. Currently Union is in first place in the ECAC standings with a 4-1 record. Mike Vecchione and Spencer Foo are gone so there is expected to be a drop-off offensively for the Dutchmen. Currently they are averaging 3.17 goals per game and that is without their two best freshman Jack Adams and Parker Foo doing much as of now. Sebastian Vidmar (8 points) who was the third leading scorer last year is tied for 4th in the team in scoring behind Brett Supinski (14 points), Ryan Scarfo (12 points) and Anthony Rinaldi (11 points). 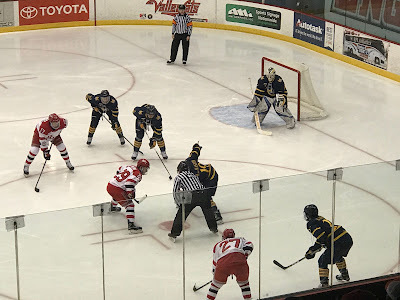 Union still has shown it can put the puck in the net though a lot of the offense came against the likes of RIT, Niagara, RPI and St. Lawrence in their recent winning streak. Still with the way Quinnipiac has struggled paying attention to details on defense this is still a good enough Union offense that can cause Quinnipiac problems.The Dutchmen power play is not as good as a season ago at just 17.86% but the Quinnipiac penalty kill has struggled to a 78.1% clip. 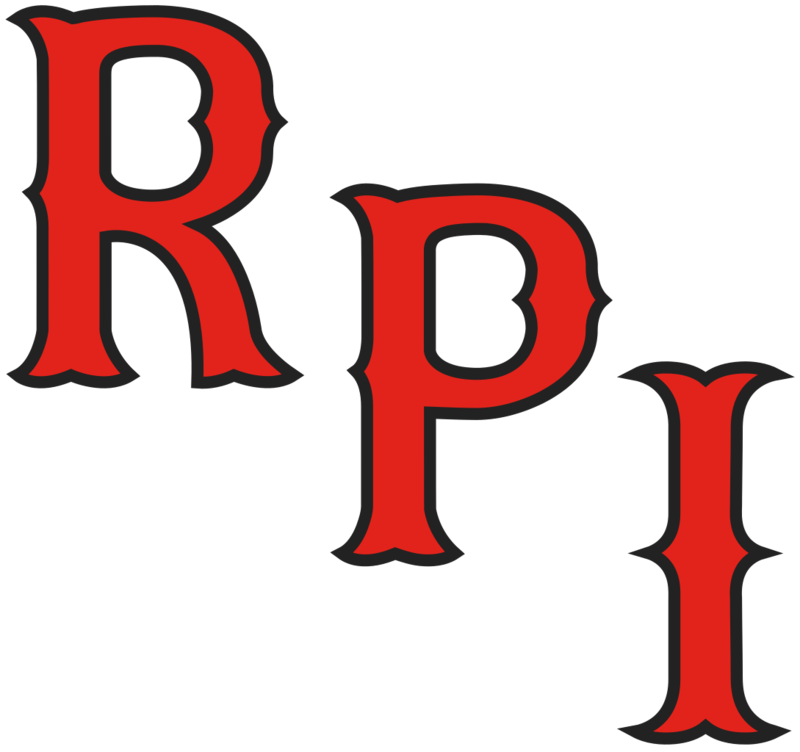 However they went 6 for 6 last night against RPI. The Union defense which a strength a season ago took a bit of a hit with the graduation of Jeff Taylor and the early departure of Nick DeSimone to a pro contract. Union still has Vas Kolias and J.C. Brassard along with junior Greg Campbell but it has a lot of youth with freshman and sophomore's manning the blue line which is somewhere that Quinnipiac possibly could exploit. Union has struggled on the penalty kill at just 76% this season while Quinnipiac has struggled on the power play at just 16% but scored two power plays goals Friday night against RPI in the loss. Union started its turnaround due in part to a goaltending change after five games. Junior Jake Kupsky started the first five games of the season and didn't record a victory while struggling with a 3.18 goals against average and an .891 save percentage but got the start and picked up the win Friday against Princeton. Freshman Darion Hanson has stabilized the position for Union, going 5-1 with a 1.84 goals against average and a .920 save percentage in the last six games to turn around the season for the Dutchmen. The Minnesota native has good size in between the pipes at 6'3 but the Dutchmen as a team played much better in front of Hanson than they did with Kupsky. 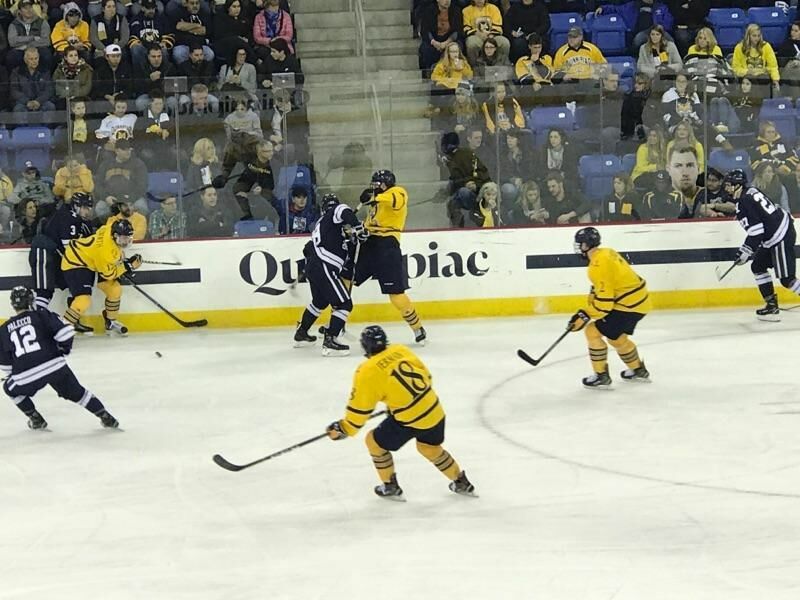 Quinnipiac is absolutely desperate for a conference win after blowing a two goal lead on Friday night against RPI when they made countless mistakes. Another weekend with no points could lead this team going in the wrong direction this season. 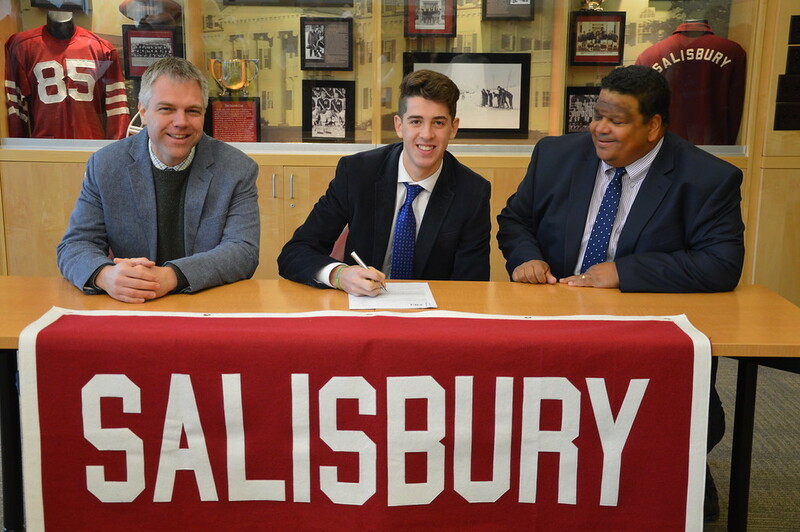 Three future Quinnipiac Bobcats have signed their national letter of intent to play hockey for the Bobcats in the near future. 1998 forward William Fällström of the Fargo Force (USHL), 1999 forward Wyatt Bongiovanni of the Muskegon Lumberjacks (USHL) and 2000 defenseman Peter Diliberatore of the Salisbury School (CT) all put the pen to the paper and signed with Quinnipiac in the last two days during the early NCAA signing period. Two of the players in Fällström and Bongiovaani are coming to Quinnipiac for the fall of 2018 while Diliberatore a native of Nova Scotia and a potential 2018 NHL draft prospect is expected to play a season of junior hockey before heading to Hamden. Fällström is most recent player to commit to Quinnipiac having done so this past Tuesday before officially signing the next day with the Bobcats. 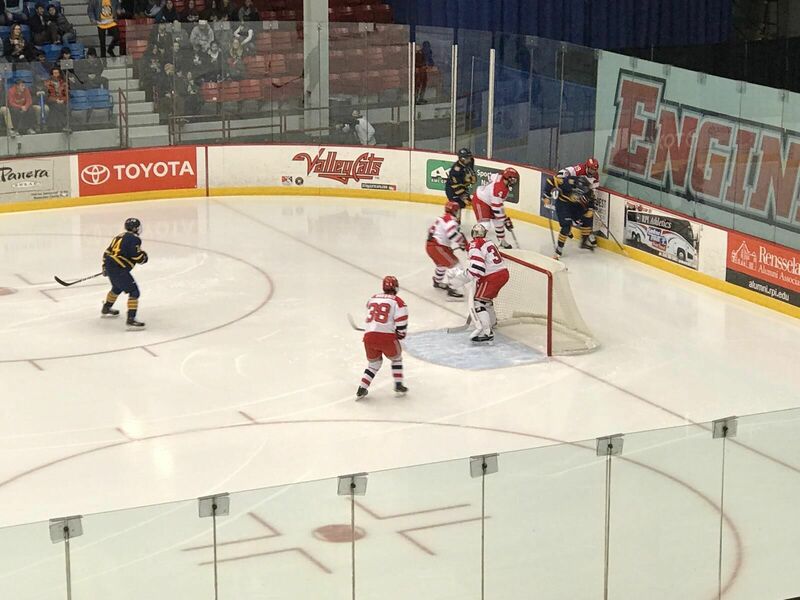 Both Fällström and Bongiovaani are expected to boost the Quinnipiac offense for next season when they arrive on campus. These three players join three other Bobcats commits who have signed their national letter of intent in Zach Metsa, Corey Clifton and Michael Lombardi. Congrats to the three newest signees and welcome to BobcatNation. 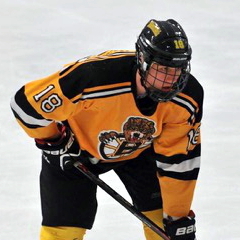 The Quinnipiac Bobcats men's ice hockey team picked up a verbal commitment from 1998 Swedish born William Fällström for the 2018-2019 season. He is currently playing for the Fargo Force in the USHL where in 11 games played, Fällström has 7 points (1 goal, 6 assists). A native of Stockholm, Sweden, Fällström is in his third season in the USHL after playing 44 games in 2015-16 with the Omaha Lancers and only 4 games a season ago with the Bloomington Thunder before going back to Sweden to play for Djurgårdens IF J20 in the SuperElit League where he had 12 points (2 goals, 10 assists) in 19 games played. The 5'11, 179 pound right shot forward has experience playing both center and left wing. Here is what the scouting service Neutral Zone said about Fallstrom. 3.75 prospect has good vision and quick & smooth hands. He plays a poised game with skill. Former Minnesota commit. 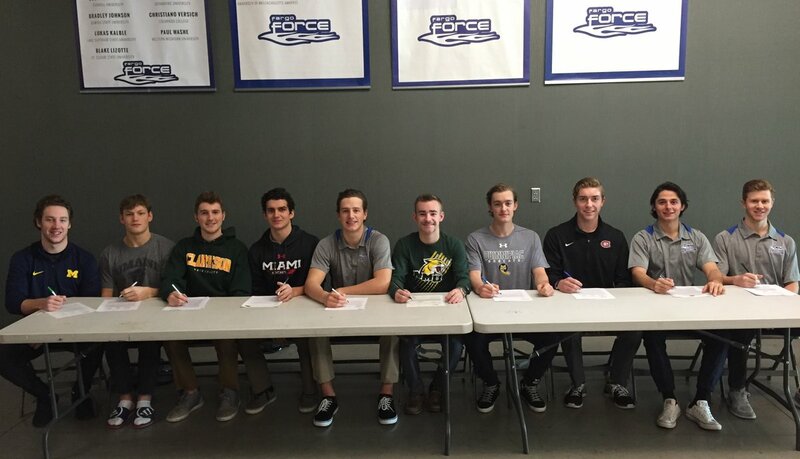 He had previously committed to the University of Minnesota back in June of 2014. 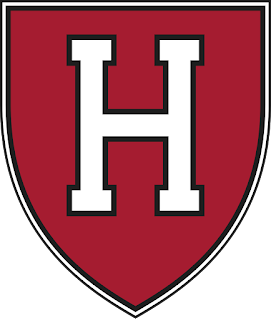 Fällström is the younger brother of former Harvard University forward Alexander Fällström who saw time with the Providence Bruins before returning to Sweden to play hockey. He has played for the Swedish National team for the U-16, U-17, U-18 in multiple international tournaments. Fällström becomes the first Swedish born commit in Quinnipiac as the Bobcats look to expand their reach over the globe at finding talent to come to Hamden.